Do brain training games really improve your brain function? So-called “brain training” games are everywhere. From high-tech apps and websites to old-school puzzle books, they promise to help improve all sorts of brain functions. The point of buying the apps and playing the games, he reiterated, is supposed to be to improve overall brain function. One company, Lumos Labs, the creator of the popular online brain training program Lumosity, boasts that it features scientifically designed games that will train memory and attention. “At Lumos Labs, we believe in improving brains—and lives. That's why we created a simple online tool to allow anyone to achieve their full potential,” the website reads.
} With more than 50 million users from 182 countries, Lumosity topped the Apple iTunes App Store charts in August 2013. The company says it collaborates with researchers from “36 top universities around the world,” and has conducted seven studies on the effectiveness of the app. There are other companies making similar claims. Berkman set out to determine if there is any truth to the claims of improving brain function. His study, published Jan. 1 in the Journal of Neuroscience, found that the games effectively improve performance at certain, specific tasks -- in this case, the tasks used in a chosen game -- but do not necessarily translate to overall brain function. To reach this conclusion, Berkman and his colleagues concentrated specifically on what is called inhibitory control. “It’s like self control, the ability to stop or put the breaks on an action that has already started,” he explained. Lumosity was not used in the study. Instead, researchers collected functional magnetic resonance imaging (fMRI) scans of the subjects – 27 males and 33 females ages 18 to 30 years – as they worked on a self-control exercise. The exercise presented an arrow pointing left or right. They had to press a button that correlated with the arrow, as quickly as possible. But 25 percent of the time, a beep sounded right after the arrows appeared. It was meant to stop the participants from hitting the button. The training group practiced every other day for three weeks. The control group practiced unrelated tasks, following the same schedule. At the end of the three weeks, fMRI scans indicated that the training group’s performance had improved slightly more than the control group’s performance. 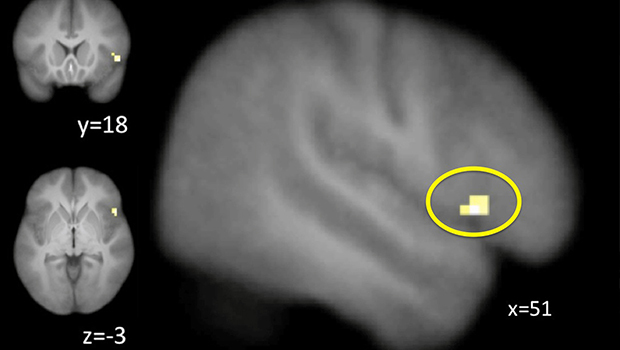 The fMRI showed increased levels of activity in the inferior frontal gyrus and the anterior cingulated cortexes of the training group. These are the two regions of the brain that control inhibitory control. He compared the experience of brain training games to that of signing up for a gym class. Previous studies have looked at the effects of video games on the minds of senior citizens. In a November 2013 study published in the journal Nature, researchers at UC San Francisco reported that video games may offset or possibly reverse the negative effects of aging on seniors’ brains. That study used a 3D video game to test the multi-tasking abilities of subjects ranging in age from their 20s to 70s. The results showed that the ability to multitask decreases with age. The older adults were then trained on the game for 12 hours over the course of a month. When performance improved, the game became more difficult. At the end of the month, they were scoring even higher than untrained 20-year-old subjects. Six months later, they were still better, even without additional practice. The researchers added that the seniors also performed better on attention and memory tests given separately from the game, which seems to contradict Berkman's results. Berkman said the difference could be related to the age of the participants. “They were looking at restoring functioning among older adults to normative levels,” he said in an email. “It is entirely possible that, for people who start off at a very low level, any kind of training will generalize to other forms, but that once you're at normal or above-average performance, you need specific training." The University of Oregon touted the study as showing that brain training apps really only work on the practiced application. But the narrow scope of the study -- it tested only inhibitory control, without testing other brain functions, such as memory -- leaves many questions and makes it impossible to say whether the brain training does also impact other functions.